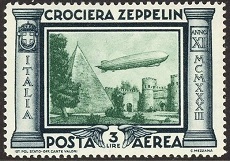 Airmail stamps of Italy, for the period from 1930 to 1933, feature more modernistic designs. Two more special flights, plus the visit of a famous German airship, also took place during this period. 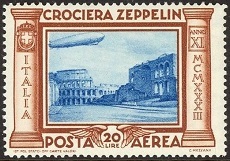 A new set of definitive airmail stamps of Italy was issued between 1930 and 1932. The new stamps, with the exception of the 2 L. denomination are now the same size as the regular definitive postage stamps of Italy, and they have a more modernistic appearance. They are all shown above (Sc. #C12-19). The stamp shown above (Sc. 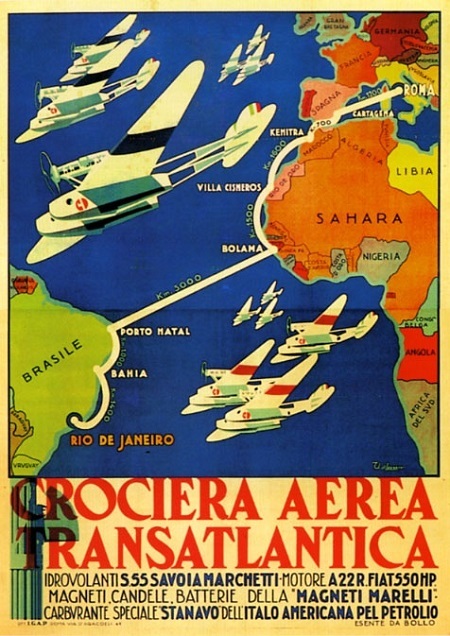 #C27) was issued on December 15, 1930 to celebrate the Trans-Atlantic Seaplane Squadron Flight from Rome to Rio de Janeiro from December 17, 1930 to January 15, 1931. The flight was made by a squadron of 12 Savoia-Marchetti Flying Boats, led by Italo Balbo, the Commander of the Italian Air Force at the time. The stamp design features a stylized squadron of seaplanes, with the Southern Cross constellation in the background. Only 20,000 of these stamps were printed, and they were only valid for postage on letters carried by the trans-Atlantic flight. Italo Balbo (1896-1940) was an Italian Fascist leader who served as the Marshall of the Air Force, the Governor-General of Libya, the Commander-in-Chief of Italian North Africa, and as the heir-apparent to Italian leader Benito Mussolini. He was one of the principle architects of the March on Rome that brought Benito Mussolini and the Fascists to power in 1922. Balbo was the only Fascist leader to oppose both the anti-Jewish racial laws and Italy's alliance with Nazi Germany. In 1926, he took on the task of building the Italian Royal Air Force. He took a leading role in popularizing aviation in Italy and in promoting Italian aviation around the World. In 1933, he was made Governor-General of Libya, where he remained for the rest of his life. On June 28, 1940, while flying near Tobruk, Balbo's plane was shot down by Italian artillery, in a mistaken-identity friendly-fire incident, and he was killed. 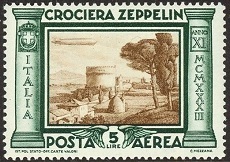 The six stamps of Italy shown above (Sc. 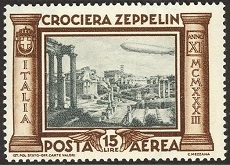 #C42-47) were issued on April 24, 1933 for the flight of the Graf Zeppelin to Rome. 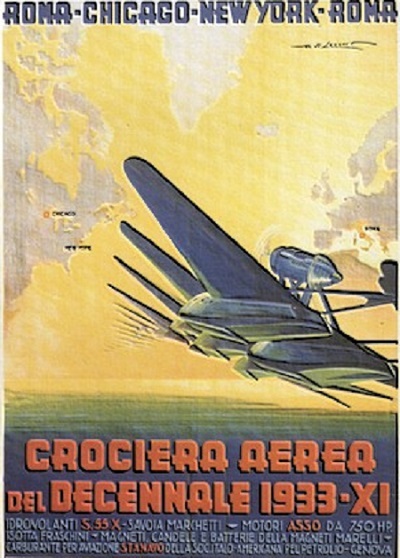 In May 1933, the Graf Zeppelin flew to Rome in connection with Joseph Goebbels' first official meeting with the Fascist government of Italy, and Goebbels invited Air Marshall Italo Balbo to join him for the flight over Rome. 3 L. - Pyramid of Caius Cestus. 5 L. - Tomb of Cecilia Metielia. 10 L. - Stadium of Mussolini. 12 L. - St. Angelo Castle and Tiber River Bridge. 15 L. - Ancient Roman Forum. 20 L. - Flavian Amphitheater (Colosseum). The total printing was 175,000 sets of these stamps. But, they were only valid for postage on letters actually flown on the Graf Zeppelin, so authentic used examples have become very expensive. 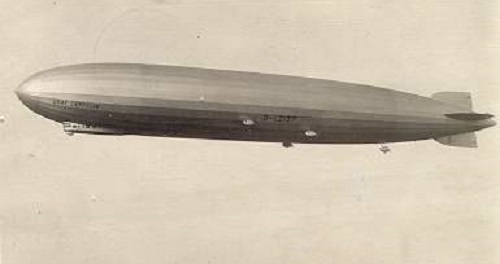 The prices in the catalogs are for used condition examples that have discernible Graf Zeppelin flight cancels on them. 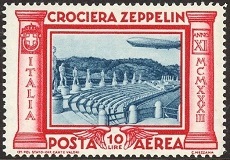 The strip of stamps shown above was issued on May 20, 1933 for the Trans-Atlantic Seaplane Squadron Flight from Rome to the Chicago World's Fair (Century of Progress Exposition). 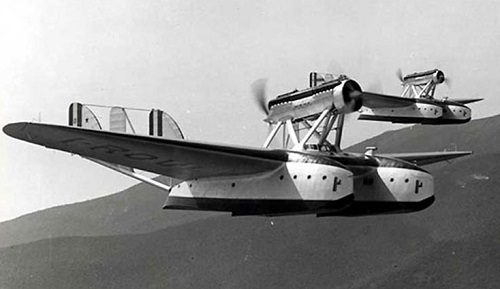 The flight was made by a squadron of 24 Savoia-Marchetti Flying Boats, commanded by Air Marshall Italo Balbo. At the left is a Registered Airmail Express label, overprinted APPARECCHIO and the abbreviation of the pilot's name. At the center is a 5.25 L. + 44.75 L. denomination postage stamp featuring the facing profile of King Victor Emmanuel III. At the right is a 5.25 L. + 19.75 L. denomination airmail postage stamp featuring a unique design for each of the pilots. The 2018 Scott Standard Postage Stamp Catalogue lists this strip as Scott #C48-49, with a mint hinged price of $125.00. For the serious collector of the stamps of Italy, this would be no big deal .... or maybe it is a big deal! The Scott catalog is very misleading here. Twenty of the twenty-four pilots in the squadron had their own unique initials inscribed on the left stamp of each strip. For a complete set of this issue, 20 of these mint strips are actually required. The strip shown above has TEUC, which are the initials of Giuseppe Teucci. Here are the 20 possible initials and pilot names used on these stamps of Italy, as noted in the Sassone Catalogo Completo dei Francobolli D'Italia e Paesi Italiani, Edizione 2004. Strips of these stamps were prepared for the return flight, but they were never issued. The stamps on the right side of the strips were overprinted VOLO DI RITORNO / NEW YORK - ROMA. Five hundred stamps were originally printed, and the few examples on the philatelic market today are extremely rare and tremendously expensive. The strip shown above (Sc. 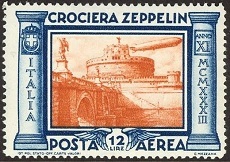 #CO1) was issued with the overprint SERVICIO DI STATO, as an Airmail Official Stamp. Only 5,000 of them were printed, and they are very difficult to find today, not to mention their having a price tag of about $4.000.00 for a mint lightly hinged example.